Until recently, Harold Plople's work has been largely autobiographic and droll, populated by various inhabitants of the off-kilter world of mental illness and addiction. This exhibition, selected from his series American Characters, finds the artist shifting gears in both subject and format. Figures gleaned from American political history and popular culture are rendered large on 48" square canvases with Plople's characteristic wit and intelligence, but here reveal a painterly bravado and formal assuredness not evidenced in earlier small-formatted works. Gestural sweeps and swirls of color coalesce with spare drawing and bits of newsprint collage in portraiture that is both humorous and insightful. 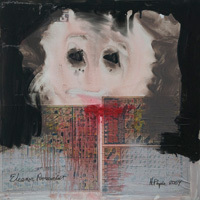 Curated by Ray and Arneé Carofano, 4 x 4 is Harold Plople's second solo exhibition at Gallery 478. Sponsored in part by generous support from the Los Angeles Community Redevelopment Agency, 4 x 4 runs through April 27. To learn more about the SPACE district, or to inquire about becoming a member of the SPACE community, call Judith Blahnik, ACE District Coordinator, San Pedro Chamber of Commerce at 310-832-7272 or click here to download the Member Application.